A sermon starter written for the 2017 Advent Offering by Thomas Dowdy, pastor of Imperial Heights Church of the Brethren in Los Angeles, Calif.
Preaching in your hometown can be very challenging. For some people, it will be difficult to see who you are today because they can only see who you used to be. Some have high expectations, while others remain very critical. I couldn’t help but think of Jesus’s options when he visited the temple in his hometown of Nazareth. He could have not gone, or he could have only said something that made the people feel good about themselves, but he did the opposite. Jesus had a mission to fulfill the promise of God. He knew it was going to upset the status quo, and yet he did it anyway. Coming home to share good news is exciting to both the giver and receiver; however, sharing words of perceived condemnation is altogether another matter. The people in the temple felt good hearing Jesus read the words of Isaiah because they were words of perceived hope and fulfillment to those that believed they were of the chosen ones. However, the purpose of Jesus was to share God’s message of inclusion not exclusion. When Jesus read from the scroll, people felt good about the encouraging words because they believed it was only meant for them. But when Jesus continued to expound on the text, the people became angry as it exposed their inner, self-seeking purposes. The Spirit continues to expose us today. Does it make you angry to include others in “your ministry”? Do you feel upset when others outside your church or group benefit from the work of your (perceived chosen) group? If so, your thinking about God’s Kingdom needs to grow. Your purpose and our purpose is to spread good news to the poor. Heal the broken hearted and free the captives. Provide wide open spaces to those who are imprisoned. Comfort the grieving. And so much more. This greater mission should make you feel good. God’s word is fulfilled as you share the good news of inclusion. This is what must be preached in your hometown and everywhere you go. 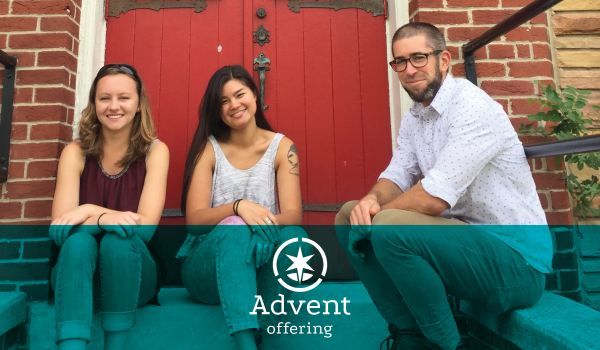 The suggested date for the Advent Offering is December 17. Find worship resources at www.brethren.org/adventoffering or give today at www.brethren.org/give . A sermon starter for the 2016 Advent Offering written by Eric Landram, pastor of Lititz (Pa.) Church of the Brethren. “A shoot shall come out from the stump of Jesse, and a branch shall grow out of his roots. The spirit of the Lord shall rest on him, the spirit of wisdom and understanding, the spirit of counsel and might, the spirit of knowledge and the fear of the Lord” (Isaiah 11:1-2). “You can’t rush perfection!” My dad uses that line every single time he is grilling for a cookout. When he is hard at work, our family constantly hovers around him and the pleasant aromas from his cooking device of choice. “How much longer? We can’t stand waiting much longer,” we wail. “Can’t rush perfection, sorry,” he replies. He’s right. You shouldn’t rush a good thing. Now that Halloween is over, our society has rushed right to Christmas. In a mad dash for your consumer dollar, businesses and corporations anticipate your holiday spending with joyful glee. We rush, blazing right past the Thanksgiving turkey and straight to the Christmas tree. We want the perfect Christmas and we want it now. In the church, we can have a tendency to fall into this same pattern. We are quick to begin singing Christmas carols that proclaim the Messiah’s birth. Our sermons, scripture readings, and youth pageants put us on the theological fast-track to the manger, complete with wise men. We would do well to remember to slow down. This is Isaiah’s new vision of hope. The stump has sprouted and the branch is growing, but it will take time. There is a sense of “good things come to those who wait” and “trust in the Lord” going on here. Isaiah is speaking to a people that are so desperate, so hopeless, and so defeated by the state of their world. Isaiah’s words are a comfort. Good news! There is someone coming who will bring about a new vision of hope and a new sense of belonging. The best part? This someone will usher in a new era of righteousness. This new world looks radically different. Wolves and lambs, leopards and kids, the fiercest hunters in nature will live at peace with those whom they have consumed in the past. Isaiah says, “For the earth will be full of the knowledge of the Lord.” The words of Jesus, and his life, from manger to cross and tomb have given us the knowledge of God’s plan for all people. Isaiah’s words are relevant and serve as a reminder for us even today. The Kingdom of God is growing. The branch of righteousness has sprung! We, as the church, are to tend the garden, to assist the branch in springing forth. Our Advent sermons should take some time to acknowledge the difficulty in waiting for the birth of the Messiah while at the same time lifting up the significance of anticipating and waiting for this promised savior. If Advent is anything for us as followers of Jesus, it is the reminder to slow down in the midst of the clanging and gonging of our modern world, and listen for that still small voice that reminds us each year that “Christ is coming soon.” You can’t rush perfection. 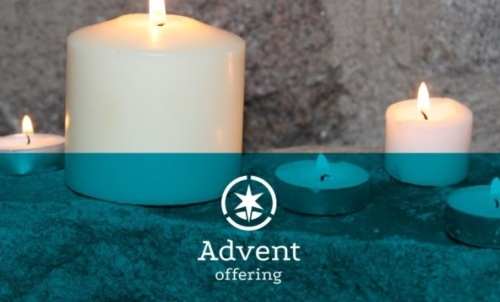 The suggested date for the Advent Offering is December 4. Find worship resources at www.brethren.org/adventoffering or give today at www.brethren.org/give . 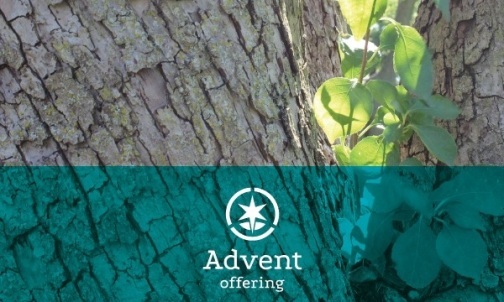 Find worship resources for this year’s Advent Offering at www.brethren.org/adventoffering . An excerpt from a biblical exegesis for Luke 1:46-49 written by Josh Brockway for the 2015 Advent Offering on December 13. At such a young age, Mary was mature beyond her years. Preparing to be married, Mary was approached by an angel. And like most heavenly messengers, the greeting was simple: “Don’t be afraid.” Whenever those words are spoken, there is plenty to fear. Yet, the young girl listened. She would bear a son, and not just any son, but the Son of God. The angel assured Mary how this miracle would come to pass. Whether she was resigned to the events or comforted by the angel’s words, she accepted the news. “Here I am the servant of the Lord.” We don’t know how Mary lived into the realities of the angel’s news. Surely she endured sleepless nights, confrontations with her family and future husband, and whispers of people as she grew more visibly pregnant. Anguish must have flooded over Mary as she lived into the implications of her words of acceptance. That makes her song, uttered in the presence of her cousin Elizabeth whose own words of prophecy confirmed the message of the angel, all the more profound. Reminded of the miracle growing in her womb, Mary began with words that echo throughout the history of Christianity. “My soul magnifies the Lord, and my spirit rejoices in God my Savior.” Rather than living in the social shame of being an unwed mother, Mary trusted in the great promises of God at work literally within her. Mary’s song echoed the words and confidence of Hannah, whose song proclaimed the great work of God after the birth of her son Samuel (1 Samuel 2:1-10). Mary identified with Hannah, whose own lowly state was raised up in the birth of another promised son, across the centuries. What God started long ago was continuing, and would stretch into the future. A close reading of Mary’s song reveals that actions were recounted in the past tense. God “has shown strength” and “has scattered the proud.” God “has brought down the powerful from their thrones, and lifted the lowly.” Mary’s confident proclamation was as much foretelling of Jesus’ ministry as it was an accounting of God’s previous actions. The Lord has done, and continues to do, great things. Find this and other worship resources for the 2015 Advent Offering at www.brethren.org/adventoffering . Support the ministries of the Church of the Brethren today at www.brethren.org/give. 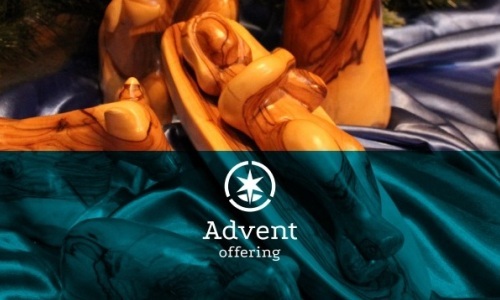 Participate in the Advent Offering today at brethren.org/adventoffering . “Blessed is she who believed that there would be a fulfillment of what was spoken to her by the Lord”(Luke 1:39-45). As a pastor, it is tempting to stay on the well-worn path of Jesus’ birth through the season of Advent. But in Luke 1, the author shows us a new perspective. He pulls back the curtain to reveal what people were doing “when no one was looking.” How did the ordinary people who encountered God respond to the invitation to serve? This is an important question because if people like Mary and Elizabeth can say “yes” to God, so can you and I. Because we’re accustomed to the story, it is easy to miss the magnificent risks Mary took by becoming pregnant out of wedlock, or how uncommon it was for people to take trips in that time. Yet Mary, an unwed, pregnant teenager, took a several-days-long trip by herself. One lesson from this story is to notice that saying yes to whatever God calls us to do may take us places we never imagined. Relationships may need to be reexamined, and the place where we live might even change as we respond to God in ways that deemed socially unacceptable. A challenge of this tradition-rich time of year is to stop long enough to notice what God is doing around us. Fortunately, Luke gives us a snapshot to help us see what God can do in the midst of ordinary people. How might God break in to our lives this Advent season? What do we need to do differently that would make room for a fresh infusion of God’s grace? Where do we need to go, to whom do we need to speak, that our eyes might be opened to how God is bringing hope in unexpected places? Tim Harvey is the pastor at Central Church of the Brethren in Roanoke, Va. He wrote this and several other worship resources for this year’s Advent Offering. Read them all, order bulletin inserts, or give now at www.brethren.org/adventoffering .